Six years ago, I lived in western Massachusetts. I was a children’s theatre director and choreographer. As a homeschooling mother of two, I enjoyed life in our little house on our quiet street. I cooked healthy food and was fortunate enough to make my own schedule so that my husband could watch the girls when I worked. I literally danced my days away. Each one filled with the satisfaction that I was on the “right “path. I taught the high school students I worked with that anything was possible if they connected with their inner voice. Then we moved to Maine. To our family, it seemed like it would be a brilliant adventure. But as life will sometimes do – things went topsy turvey and I ended up upside down. All of a sudden, I lived in Maine. I worked in an office full time. I sat at a desk. My kids were at school. Our street was busy and we often ate from boxes in the freezer. For about a year it was okay. Until one morning, I woke up and I realized I dreaded getting up. I dreaded my day. There was a lot of stress and very little joy. That was when I realized I had no idea who I was anymore. I had no frame of reference for the reality I was currently living. This feeling was both foreign and terrifying. I had always known who I was and what I was doing. I was the creator of my reality, and I had been really good at it before! But I had burnt out. I didn’t want to replicate the life I had lived before in Massachusetts. But I also did not want this. Sitting at a desk all day was not agreeing with me. So what did I want? I tried asking myself but I got no answer. I thought I had done everything right. I had imagined, envisioned, intended, affirmed, even taken action. Taking a risk, I had jumped in with both feet. But instead of landing on solid ground, I was free falling into an abyss. I had lost me. The enthusiastic, beautiful, sparkly voice inside was gone. I decided then and there to find it. Sitting at my desk, I was still through the looking glass. But at least I had landed. As I had become more accustomed to the landscape, I had started exploring this new reality. And, like Alice searching for her rabbit, I was intent on sharing my plight and seeing if anyone else knew which direction I should go in. Unfortunately, as it turns out, seeking the guidance of others is not really helpful. Understandably, many were too caught up with their own path to be of assistance with mine. And so, I spiraled. Catching glimpses, reading books, writing journals, listening to podcasts, having deep self-pitying conversations, reading more books, and so on until one day I was so wound up….. Literally. I snapped right in my husband’s face when he dared suggest that maybe it would be nice for me to take a yoga class or something. Suddenly I wasn’t Alice anymore. I was the Red Queen. And that was when my loving husband put his hands on both my shoulders, looked me square in the face and said, “I need you to go to yoga.” And before I could scream, “Off with your head!” he pushed me into the absolute deliciousness of my first restorative yoga class. And guess what? In that quiet deliciousness, I found me. I was right there. I lied there in Supta Baddha Konasana breathing in, breathing out, and melting into bliss. I felt that sparkly, spiraling energy, my true essence, for the first time in three years. I almost started laughing out loud. I am still at the same office, but somehow the color has filled in the gray that was my life. I still don’t like sitting all day, so I find reasons to stand and move. Since my yoga teacher training, I might say people see me differently, but I know it is really that I see myself differently, and that has made all the difference. People walk all sorts of roads to find themselves when they are lost. Yoga was mine, and I am eternally grateful for the practice and the guides who led me to it. Melissa Urey is a children's programming specialist and political advocacy administrator. While searching for peace in 2011, she found yoga. After completing her 200 hour teacher training with ShivaShakti School of Yoga in October 2016, she began sharing her love of yoga with people of all ages. 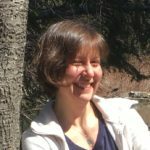 She is currently pursuing her 500 hour advanced teacher training and teaches Little Yogis and Adult Foundations classes at Spiral Tree Yoga in Portland.